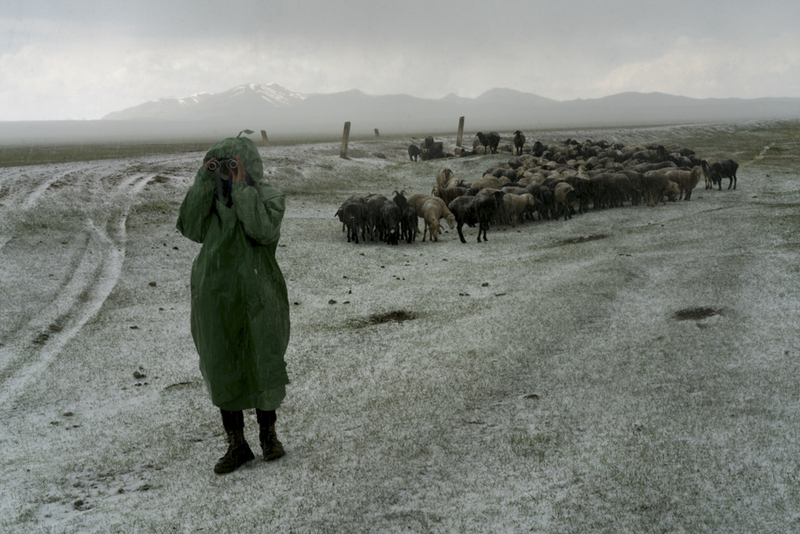 Myrbek, 20, looks for sheep separated during a hail storm. 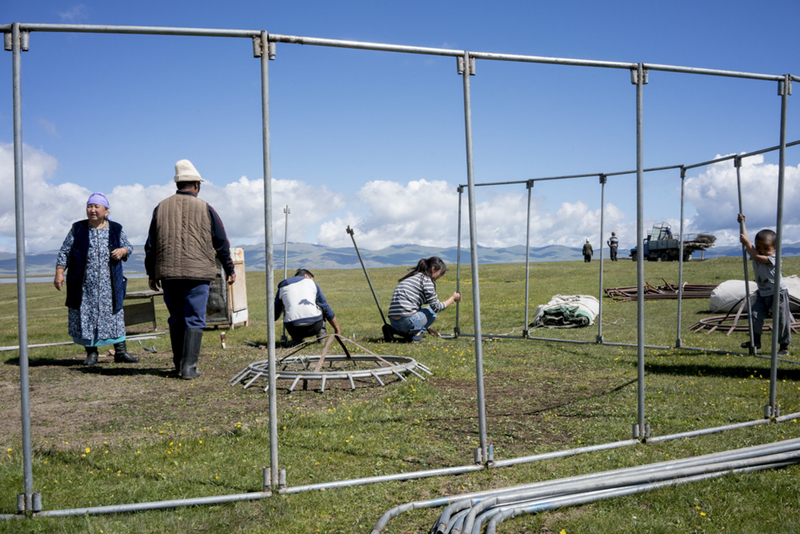 It’s late summer and 10 members of the Arsanaliev family are packing up their yurts, preparing to herd their sheep and goats back down to the valley for winter. 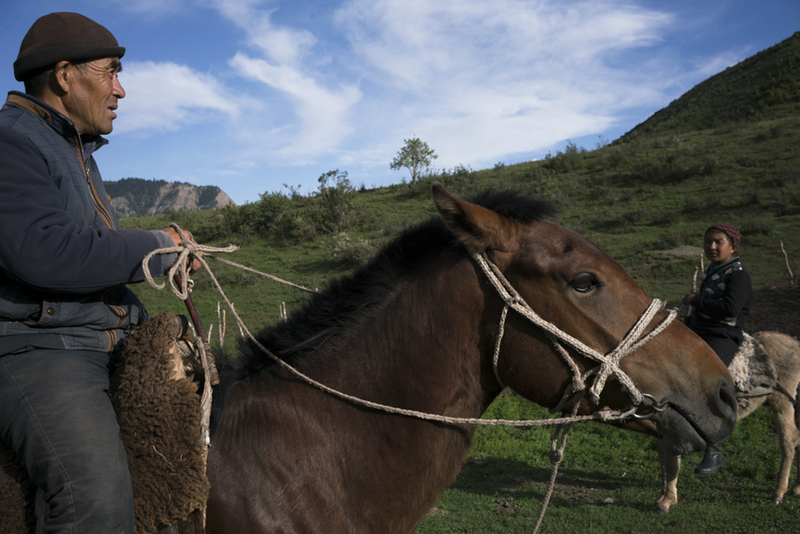 The annual roundtrip begins each June, when the Arsanalievs leave their mud-walled house in Akkyya, a small hamlet in central Kyrgyzstan, to take their livestock up to the nutrient-rich, high-alpine pastures surrounding Lake Song-Kol. 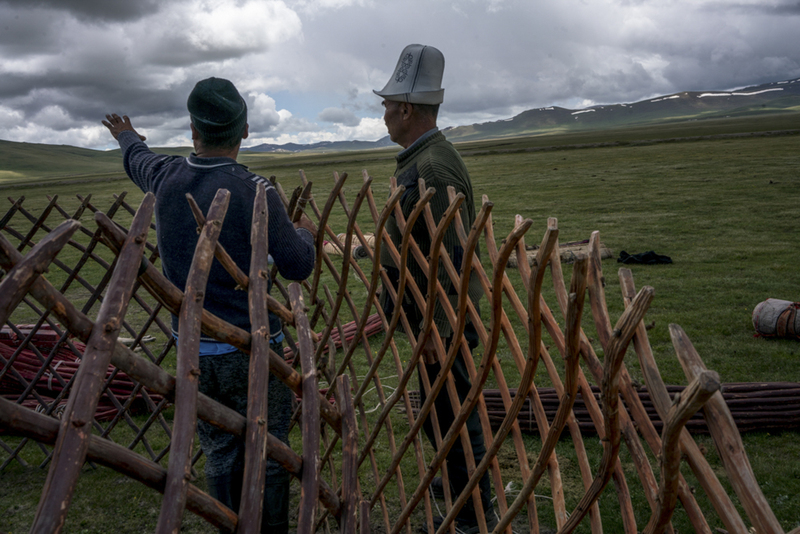 They follow in the footsteps of countless generations of nomads before them, pitching their yurts in the same jailoo every year. Their first stop is a wooded valley north of Akkyya, where they spend about six weeks. The old and young arrive after two hours in an aging Soviet Niva jeep; brothers Myrlan (29) and Myrbek (20) bring the animals up on horseback – a journey that takes about 24 hours. 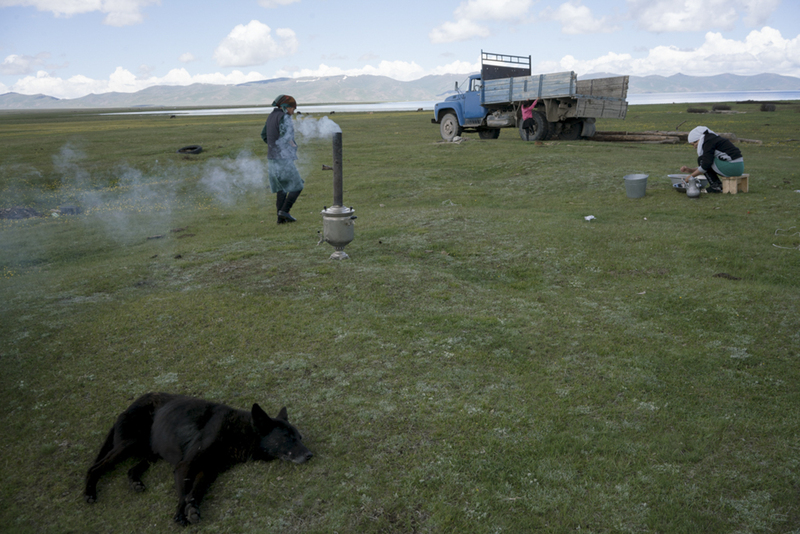 Myrbek briefly rests after a long day collecting firewood in a small forest near the intermediate jailoo. Myrlan and his brother Myrbek play cards after a long day. With their Niva jeep, the brothers gather fresh water for the family camp. 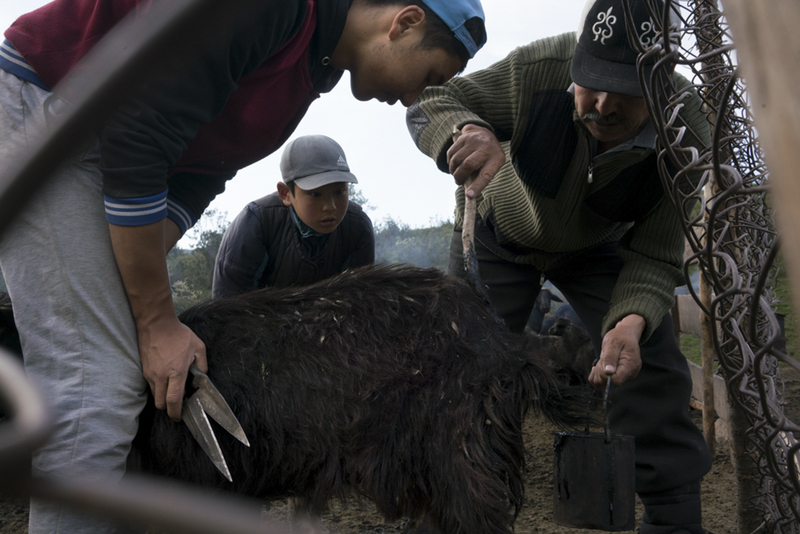 A man and his son from a neighboring camp come to select sheep to buy from the Arsanaliev family herd. 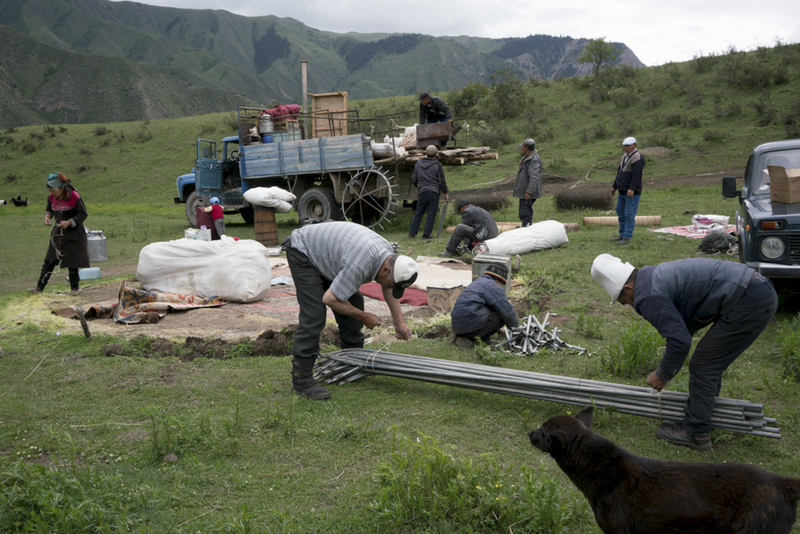 Though many Kyrgyz today seek work in urban centers, it is common to see groups of semi-nomadic herders guiding their livestock up and down the mountains each summer. Zamir Arsanaliev, his son Myrbek (20) and his grandson Tarastan (10) mark sheep and goats from the family herd with homemade pitch. By July the family moves on to Song-Kol, 9,895 feet above sea level – another grueling journey for the brothers over mountain passes. The Arsanliev family and a handful of friends from neighboring yurt camps help set up the family's five yurts in their summer pasture in Song-Kol. 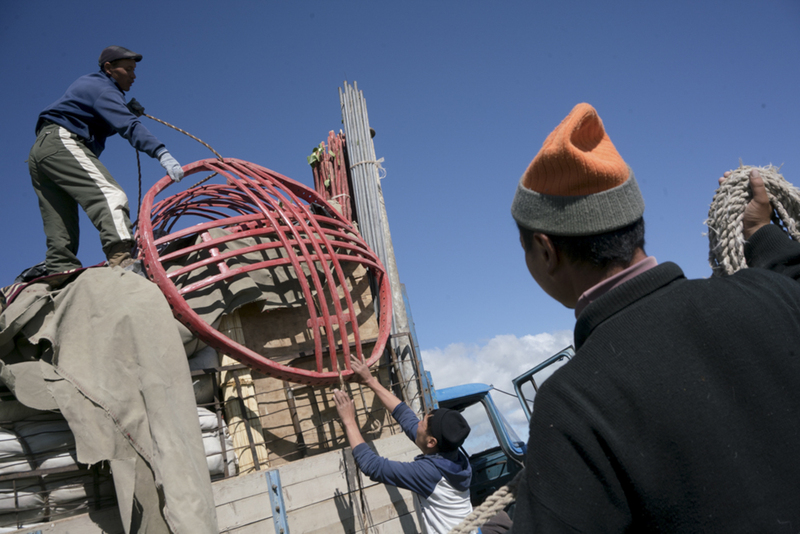 The Arsanlievs own traditional Kyrgyz yurts with wood frames and these cheaper Chinese-made yurts with metal frames. 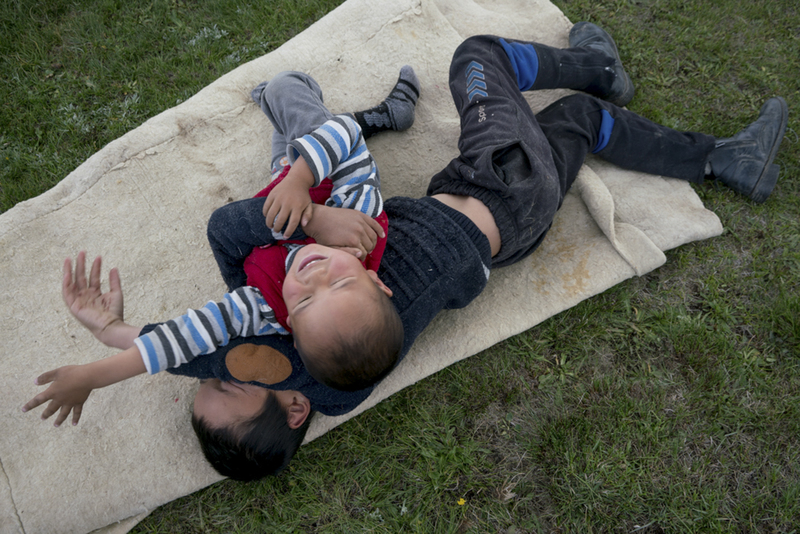 Young boys play while their families work on the Arsanaliev camp at Song-Kol. A sheep is prepared for a feast to honor a veterinarian visiting the jailoo. The family prepares tea and mutton for a coming feast. The physically demanding schedule starts at sunrise and ends at last light. Myrlan and Myrbek tend to the livestock while their mother supervises her daughters-in-law, who spend much of the day cooking, cleaning and caring for the children. 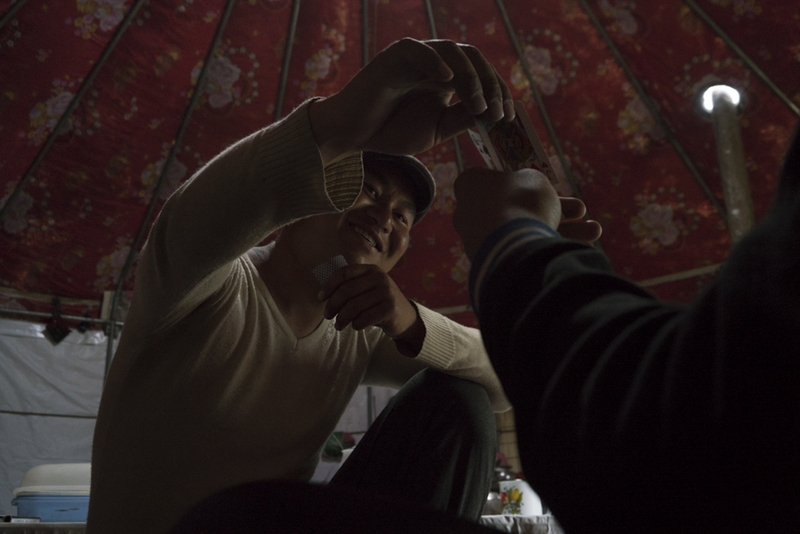 Zamir, the patriarch, and a friend from a neighboring camp set up one of five yurts belonging to the Arsanaliev family. 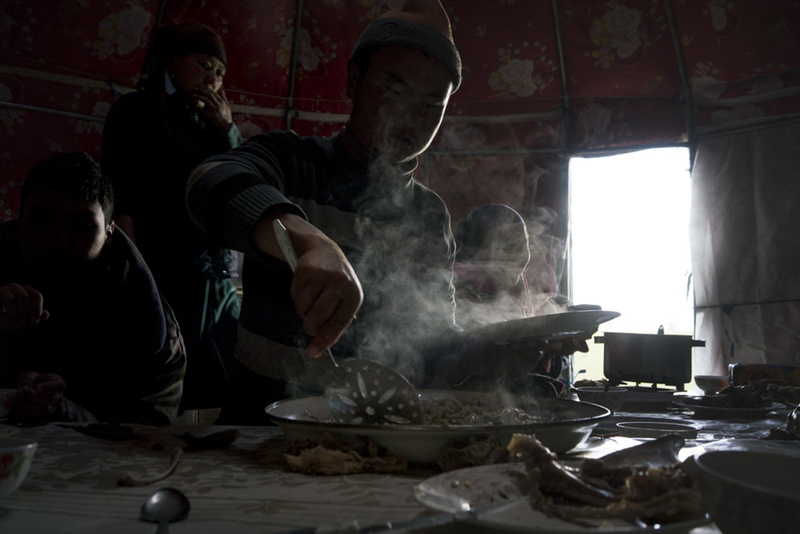 Fresh mutton is served to guests from a neighboring camp at Song-Kol. Seating arrangements and the order in which people are served at meals follows a specific hierarchy according to age, gender and who has the most children. Zamir watches over his family’s herds in the early morning. 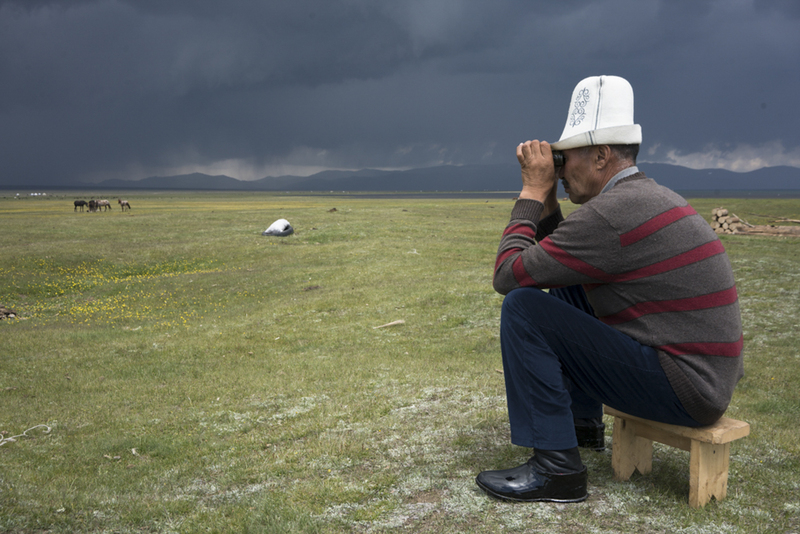 Weather at Song-Kol is unpredictable; clear skies often give way to hail and thunderstorms. On any given day, temperatures can rise from below freezing to the high-90s Fahrenheit. 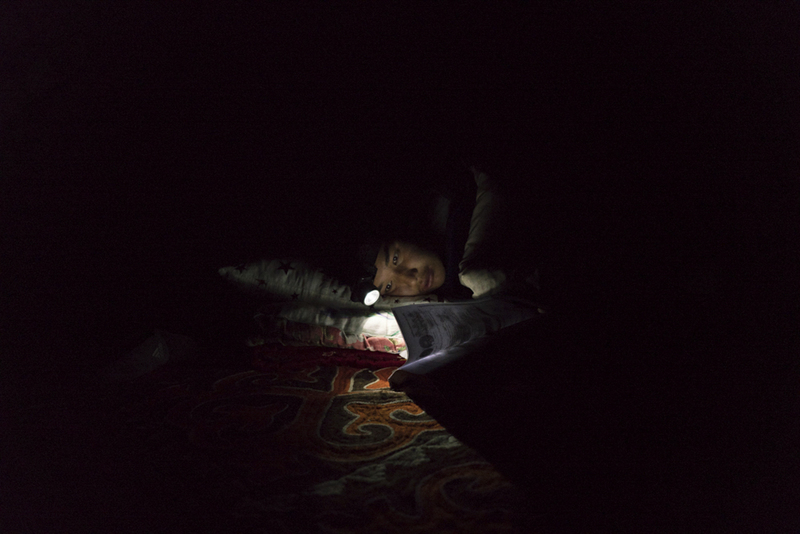 Myrbek reads a German textbook by headlamp before bed. He studies the language in hope of one day working in tourism. 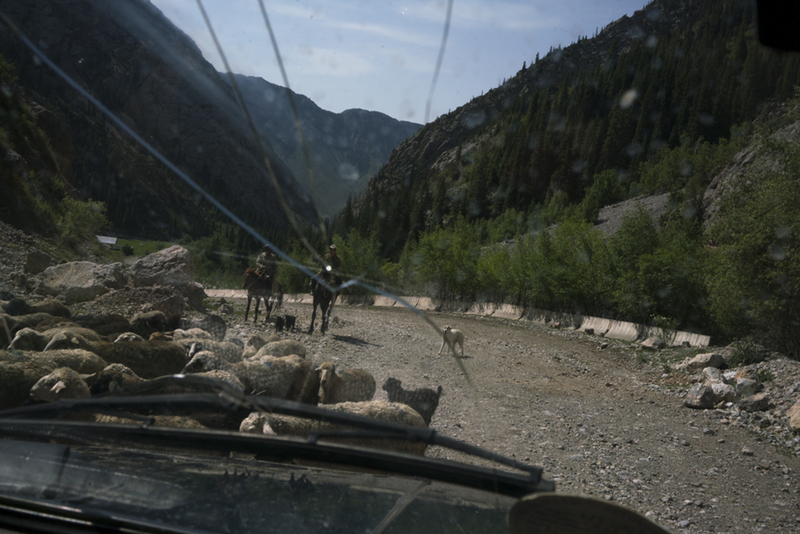 The Arsanaliev family Niva squeaks past a shepherd and his herd on the winding roads descending from Song-Kol to Akkyya. The Arsanaliev family waits in their aged Niva jeep as the two eldest sons repair the carburetor. 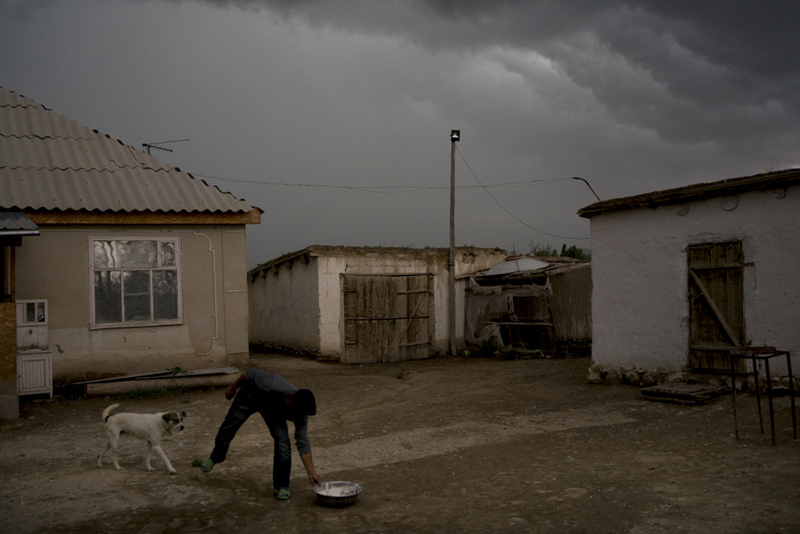 A storm rolls in over the family home in the small hamlet of Akkyya, Naryn province.